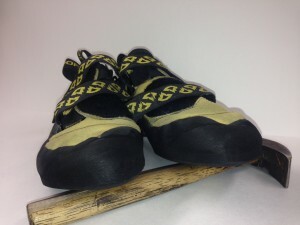 Whether you’re sporting the latest model climbing shoes or slab happy in your old favorites, one thread connects all climbers; we love our shoes. At The Rubber Room, we’ve spent years climbing and caring for rock shoes. Our evolving techniques will revitalize your favorites while maintaining their glove-like fit. Resole: A resole is a general term for applying new soles to shoes. BITD shoes were inexpensive and climbers wore them to the bitter end. 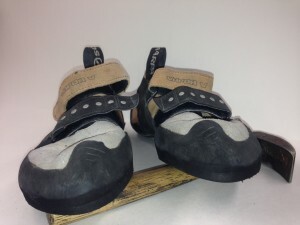 Before the advent of Sport climbing trad shoes needed full soles and rands. 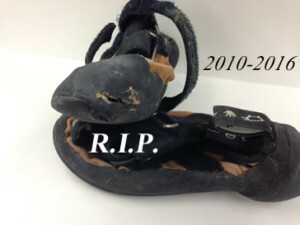 As climbing evolved and the shoes changed it became more appropriate to resole just the front “½ sole” of the shoe. When necessary the rands are repaired as well. Don’t be crying at the crag over blown out shoes! 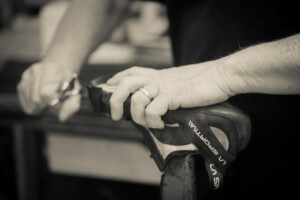 Start by checking out our shoe repair overview, then head over to our repair request form. Fill that out and submit, print out the results, and mail it in with your shoes. Once we get your shoes with your request, we will evaluate your order and contact you if requested, or you can give us the go ahead in the repair form and we will proceed with appropriate repairs. Here’s where the magic happens. We really know our climbing shoes, and you can trust us with yours. We return your shoes to you, ready to go, using the shipping service you indicate. Even though I have a shoe sponsor I’ve been getting my shoes resoled at the Rubber Room for over a decade and their craftsmanship never ceases to impress. Their work exceeds my expectations every time and I always like my shoes better their second time around as opposed to fresh out of the box. Nothing but respect for Tony and the crew at the Rubber Room, countless years you’ve helped me enjoy climbing with great resoles and friendship.